Scotland assistant coach Peter Houston believes Craig Levein has the strikers to compensate for being minus the country's most expensive player. New Sunderland signing Steven Fletcher remains in dispute with manager Levein as Scotland prepare for Saturday's World Cup qualifier against Serbia. "It's a department we are well off in," said Houston. "We are thinking positive and looking forward to it with the group of players we have got." 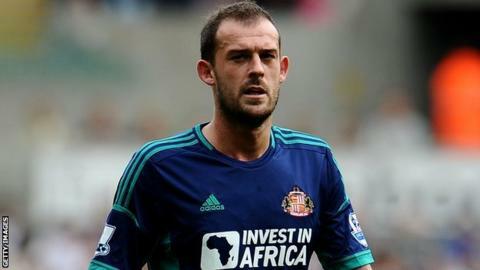 Fletcher repaid some of the £12m fee by hitting a double on his Premier League debut for Sunderland in a 2-2 draw at Swansea on Saturday. But Houston brushed off the reminder of what Scotland are missing out on amid the striker's continuing failure to contact Levein after pulling out of a squad 18 months ago. "You look at Jordan Rhodes, who has been in excellent form and got an £8m move," Houston said of Blackburn Rovers' new arrival from Championship rivals Huddersfield Town. "Kenny Miller has settled in well and another lad who has been with us, Craig Mackail-Smith, who didn't make the squad, his two goals were absolutely sensational at the weekend. "Ross McCormack scored in the Championship - what a goal he scored. There are guys who are naturally good goalscorers." Everton forward Steven Naismith believes Levein is not concerned that the loss of Fletcher could come back to haunt him and his team. "The manager has made his point on it and it is his decision," he said. "He made it clear to everybody what he wants and what he expects. "The other guys who have come into the squad are the ones you need to be talking about. "Jordan coming in last month, scoring on his debut and putting in a man of the match performance. "And there's Kenny whose been a massive player for the last 10 years. "These are the guys you have to look to to do it for the country, backed up by the strong midfield that we've got. "There's going to be decisions to be made and not everybody's going to be happy. "But, if it comes off for the manager, you can't complain and they weren't saying much last month when we beat Australia. "They are the decisions managers have to make and I'm sure he's comfortable with the one he's made." Like Naismith, Wigan Athletic forward Shaun Maloney has been in good form in England's top flight and says that players have to accept there is much competition for place in the Scotland squad. "If you don't start, you need to take the decision professionally and show respect for your team-mates who have been selected," he said. "If you don't play, you just get ready to hopefully make an impact from the bench. "There's a game three or four days later, so there might be a reason for you not playing tactically and that reason might change three or four days later."